The HE73 and HE53 halogen moisture analyzers are reliable and cost-effective solutions for determining the moisture content of your products to maintain quality and ensure optimum shelf-life. 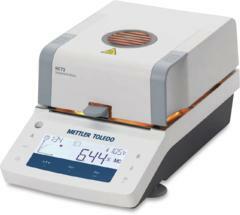 These robust and affordable moisture analyzers benefit from METTLER TOLEDO’s extensive experience in manufacturing precision instruments and years of moisture analysis expertise. The HE73 and HE53 are simple to use, even for untrained operators. With on-screen assistance and our free Moisture Guide, you have everything you need to quickly setup and start making accurate moisture measurements. Designed in Switzerland, you will not only have confidence in your moisture results but also be reassured of great performance for many years to come. Process Moisture analysis has never been so easy, just follow the on-screen graphical guide and your results will be ready in just a few minutes.